Prezident Brown graced the stage of the Flamingo Cantina the week after the storm. Here is a short backstage interview before taking the stage on September 9, 2005. SI: Prezident Brown, Austin gives heartfelt thanks for your presence tonight. Austin has recently become the home for many people who have been through terrible devastation this week. Do you have any words for the people of New Orleans? PB: Yes, what I would say to the people is that this is nature work. When nature unleash, there is not much man can do. We must give thanks to survive. The goodness is you are in Austin and the US, so give thanks and praise to the Most High for life. Regroup and come again because this is not the end. SI: You come from Clarendon? You have seen some of the same kind of devastation in Jamaica? PB: Definitely. I have been through Gilbert and other kinds of storms. SI: You received so much love and positive reinforcement for the CD “For Jah Only.” What has been going on since then and how would you describe the current state of your career? PB: The current state of I-man career is in the ‘live’ field right now. Yeah, cause you can fire up a CD but what you cannot fire up is the live vibe of Prezident Brown, so I stay with the live show for now. SI: And where are you mainly performing these days, the west coast? PB: Yeah, the music and I-man was more accepted on the west coast for some reason, more openly, so it was easier for me to enter. We hope to spread it further into the east and all over. Yeah, I was just at Reggae on the River. It was great to see such joy and happiness of people coming together through music. SI: I know you recorded with Jack Ruby for a good part of your early career and then in the early 1990’s broke loose about the same time Tony Rebel and Garnett Silk brought a new consciousness to the dancehall. What can you say about where dancehall is going since that time? PB: Well, you have dance music whether it is European or whatever culture. You have electronic music and what Jamaica has adopted recently is the movement of being more computerized and using all these machines. So you find a lot of youths and even musicians trying to show their skills through a drum program or a sequence which I’n’I see as a phase. It’s just something that is happening. I call it dance music, they say it’s dancehall but when I was a teenager what was dancehall? It was a place that you go. Not a music. (laughs) It is still a place that you go. So, I guess, as it unfolded, they had to find a name to give to this form of music. In other words, you should know it is not reggae music. Just because it comes from Jamaica does not mean it is reggae music. Dancehall is a younger generation ting like techno, not Caribbean fashion with mento beats, yuh know? Yeah! So, I don’t personally have anything against dancehall because it is still coming out of the root of African people who were transplanted across the seas. Same. It is just they are using the computer to program the beats. But I see where there is place and time for everything. What I see happening in Jamaica right now is people are starting to gravitate again to ‘live.’ Every man want to lay a riddim track right now. He is doing it live because that is the sound people are gravitating to… After certain cycles and people come to realization and spiritual confrontation, they realize we are not really going nowhere. We need ‘dis’ and we need ‘dat.’ We need LIVE music. We need to transport the message through the right and proper way, through MAN, not machine. So, as I say everything has it’s place and time and dancehall has it’s place. SI: Would you say some of the controversy surrounding dancehall artists has hurt some of the more conscious reggae artists and their ability to perform and be seen live? PB: Nuh, I don’t really think so. I may not be able to perform in Jamaica, but you will see me someplace else. If I-man is not accepted at that time, I will be seen other places. SI: I have fond memories seeing you and Jack Radics perform many times in Negril. I never see you at shows like Rebel Salute or Western Consciousness? Why is that? SI: (laughing) So what you are saying is I will see you at Rebel Salute in January? PB: No, not necessarily. It does not mean that. Rebel is a bredren and if I want to be on Rebel Salute, I will be there. SI: Let’s go back to the Negril scene. For many years I saw you and Jack in Negril at DeBuss on New Year’s. PB: Right, cuz that is Jack’s birthday. Jack is my real tight bredren, yuh know. We play for the people dem. SI: Miss Joy was a part of the rich history of Negril music. What can you tell me about DeBuss and it’s role in helping artists be known in the international market? PB: Yeah man. A lot. I think Miss Joy is a person with open vibes. She is a people person so I used to go to DeBuss with a soundsystem, Jack Ruby, I call it. Miss Joy invited me from that time. DeBuss was a nice ting for Jamaica. It was a place you could really come and play some music. You can jam, and play music and it was well appreciated. 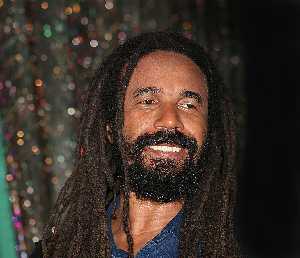 SI: Do you think DeBuss introduced many artists to travelers who did not know reggae music or certain artists? PB: I would not say ‘introduce’ I would say, ‘refresh the memory of the people’ who come as tourists and maybe hear some reggae music and did not know who sing that song. Maybe they look and see a brother and realize who that artist is. Although, maybe it is true that I-man introduce some people who had not heard reggae before, so in that way, yes you could say that, too. Yeah, you are right. SI: There are singers and there are dj artists. Where do you draw the line? It seems to me you are both. PB: I-man is a chanter. SI: You would not call yourself a singer? PB: Nuh, I think of Beres Hammond when I think of singer because Beres can sing some cleaner notes than me. Yuh know, I have this interview with Neville Willoughby on the radio and he was saying the same thing. He was playing the song “For Jah Only” and he was saying this was nice singing. I say “Neville, I don’t really see myself as a singer, I am a chanter.” He say “Well, I don’t know what you want to call it, but if this is not good singing, I don’t know what is.” I would rather to say I am a chanter because I know how I carry my notes and I can’t carry my notes say like how Richie Stephens carry. SI: So it is purely a delivery style? PB: Yeah man, I-man is nyabinghi so I am of the age where I chant nyabinghi. Chant I Chant. I didn’t think Bob was a great singer, either. Bob was a chanter. Burning Spear is a chanter. So I kind of see myself worrying that the region coming out of a sound system, I think that is what keep I up till now. That one could even refer to I in regard to ‘Jah Only’ as great chanting that can be played any time. SI: True. Do you have another cd coming out soon or are you solely doing the live performance? PB: I come forth with enough music now. We have a thing called Volume I, Volume II, Volume III. We are working on Volume IV. There is also an album that many people in the US might be able to get when I set up PrezidentBrown.com It is really on Sony- Germany and called ‘Generation Next’ which is a great, great album. That came after “For Jah Only.” Somehow I don’t know if it was a spiritual fight or what is happening but for some reason Sony has not released it in the US. So we will provide that while on tour. I will be able to sell this great cd and sign it making it more spiritually blessed. SI: What is the biggest challenge you see for reggae artists today? PB: (Pauses to think) In order for the music to cover the four corners of the earth, and also, where money is concerned where I can live comfortably, it takes a network. So the biggest challenge is networking. I did see a problem with the thing that Bob Marley created. Bob Marley is the biggest name in reggae and one of the biggest names in music. And yet, what is Tuff Gong really doing? That me ah say. Bob Marley made a studio and a presence, one that should continue to be seen and his dream grow to help others. I think his dream was to create an organism within the Jamaican scene that would put the music out deh. And carry the Marley/Gong clout across the world and set up a network and groom the artists, or whatever you need to do and put them out deh. I nuh see it. I think say, one should carry on Bob Marley dream. I don’t see Tuff Gong a do that still. SI: Why aren’t there more women in the forefront of reggae? PB: Because of male ego. The whole world need a change when it come to the ego of the male. It come from Biblical days still. I cannot go into the whole of that because it will take a whole night to really explain what I want to say. SI: Well, let’s be sure to do that next time. I want to know more about this issue. PB: Yeah, it is just male ego that keep the woman suppressed so it is harder for a woman to come forth and sing some music without being harassed by a whole heap of man who says he is producer and all kind of things. They just don’t bother. That is what I think, straight up. SI: I know you are getting ready in a few minutes to go on stage. I just want to give thanks and praises for all the music that you have given us especially the strong message and faith that makes a true and loving difference in people’s lives. It’s a beautiful gift that you share. I don’t know how often people get an opportunity to give you the love back so I want you to know the love is still strong. PB: It is a hard thing to do because you barely survive at times and I really have to draw from the spiritual rim to stay strong. I have to go out that extra to come forth with this vibration because this is not what the world will buy, yuh know? You have a process of negative and different kind of things, and they bite, unfortunately. That is what make the work of Jah Almighty strong because of adversity. I have one thing to say: never let prosperity block eyes of circumspection and never let adversity drag people into depression because they carry smiles and frowns, but they do not last forever. The smiles of prosperity do not last forever and the frowns of adversity do not last forever either. Salvation lasts forever. We must trod firm and give thanks and share the joy the love through music. Sista Irie is the host of The Conscious Party on 88.7 FM KAZI, Austin, Texas.